Victoria blanked by Vancouver 3-0; Game 2 goes tomorrow night in Langley. 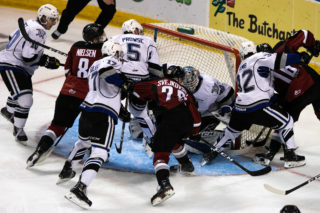 Langley, BC – The Victoria Royals were defeated 3-0 by the Vancouver Giants at the Langley Events Centre in Game 1 of their Round 2 match-up. Vancouver leads the best-of-seven series 1-0. Vancouver – Jared Dmytriw 1g-1a, Bowen Byram 0g-2a, Davis Koch 1g-0a (Game Winner), Dawson Holt 1g-0a, Alex Kannok Leipert 0g-1a, Dylan Plouffe 0g-1a. 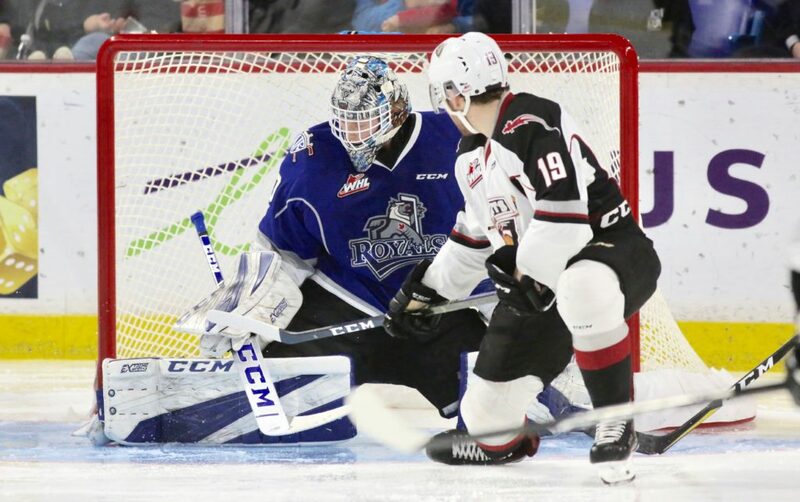 Royals – Griffen Outhouse (L) – 59:16 mins, 25 saves on 27 shots. Vancouver – Trent Miner (W) – 60:00 mins, stopped all 15 shots he faced. Royals – 0/3 = 0.0%. Vancouver – 1/3 = 33.3%. On the Board First: In all seven of the Royals’ playoff games this year, the team that has scored first has won. Meanwhile, in the Giants’ seven postseason contests, the club who has opened the scoring has been victorious on five occasions. Playoff Experience: Victoria has a combined 335 games of postseason experience while Vancouver has 299. Royals’ defencemen Ralph Jarratt has dressed for 44 games which leads the way for Victoria, while Vancouver forward Jadon Joseph leads his club with 43. Leading the Way: Phillip Schultz of the Royals is currently tied for third in postseason scoring with nine points (2g-7a). Giants’ forward Davis Koch leads the WHL in playoff scoring with 11 points (2g-9a). Postseason Battle: With the loss tonight, Victoria is now 4-4 against Vancouver in the club’s playoff history. Up Next: Victoria continues their Round 2 match-up against the Vancouver Giants in Langley with Game 2 tomorrow night at 7:00 p.m.
Back at the Barn: The Royals will come home for Game 3 against the Giants on Tuesday, April 9th, and Game 4 on Thursday, April 11th. Puck drop for both games is at 7:05 p.m. Tickets can be purchased in person at the Select Your Tickets box office, over the phone by calling 250-220-7777, or online at www.selectyourtickets.com. Game 2 – Saturday, April 6th – Langley Events Centre – 7:00 p.m.
Game 3 – Tuesday, April 9th – Save On Foods Memorial Centre – 7:05 p.m.
Game 4 – Thursday, April 11th – Save On Foods Memorial Centre – 7:05 p.m.